Eventually, all energy will have to come from sustainable sources, i.e. the sun. In the transition period, which is likely to last several decades, energy from fossil sources will continue to be used on a large scale, including the enormous amounts of carbon stored as coal and gas. Liquid fuels such as gasoline and diesel are attractive as medium for storing and transporting energy, as their energy content per unit of volume and weight is unsurpassed, and the necessary infrastructure is widely available. These factors make conversion technologies as gas, biomass and, not in the least, coal-to-liquids attractive options. Synthesis gas, a mixture of carbon monoxide and hydrogen, is the key intermediate in all these conversions. Hence, the chemistry of synthesis gas (or syngas) is a key topic in catalysis. Our partner Synfuels China Technology Co., Ltd. Is a renowned specialist in converting coal to liquid fuels in a clean way, based on a more than 30 years long tradition of R&D. Syngaschem BV is proud to be Synfuels China's partner for fundamental research in catalysis and surface chemistry. Clean Coal-to-Liquids (CTL) technology is greatly preferable to direct and distributed combustion of coal, as toxic impurities can (and have to) be removed in syngas generation. 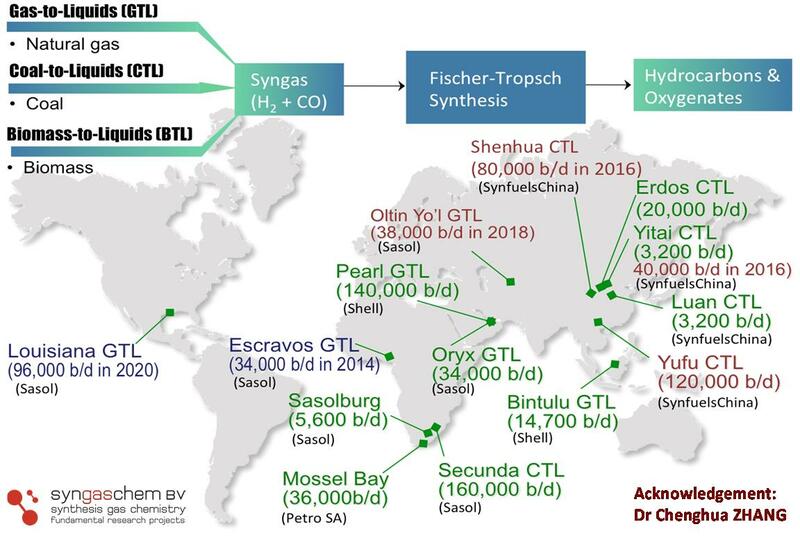 The challenge of CTL is that additional hydrogen is needed, which should be produced without generation of extra CO2 to reduce the carbon foot print to the level of GTL technology. On the long term, syngas derived from CO2 and solar H2 provides the perspective of a sustainable route to non-fossil fuels, which still offer the energy density and convenience of today's transportation fuels. Fundamental knowledge and well-trained people form the key ingredient for optimizing these technologies. Shifting the emphasis from the use of oil to the use of coal and gas prolongs the time we have and generate the funds we need for research and development towards truly sustainable forms of energy. Of course, these fossil ressources need to be used in a responsible manner, e.g. with appropriate environmental care. According to a study of 2008, 2-3 x1012 barrels of fuel can be produced in potential using GTL and CTL technology all together. At the present rate of consumption, this covers global fuel supply for 60 - 80 years. However, at the moment production costs in GTL and CTL are considerably higher than in conventional fuel production. Reducing these production costs is a huge challenge as well as a huge opportunity. 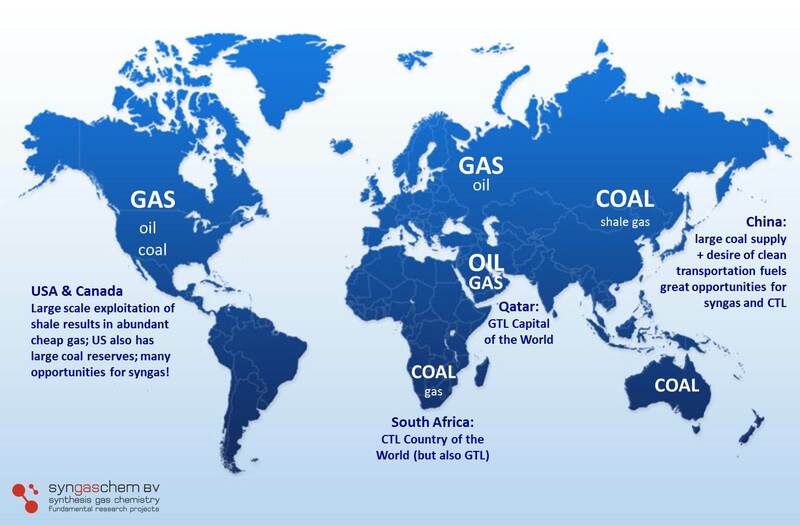 World wide capacities of GTL and, in particular, CTL are expected to grow in coming years. The major growth of CTL is realized in China using technology developed by Synfuels China. 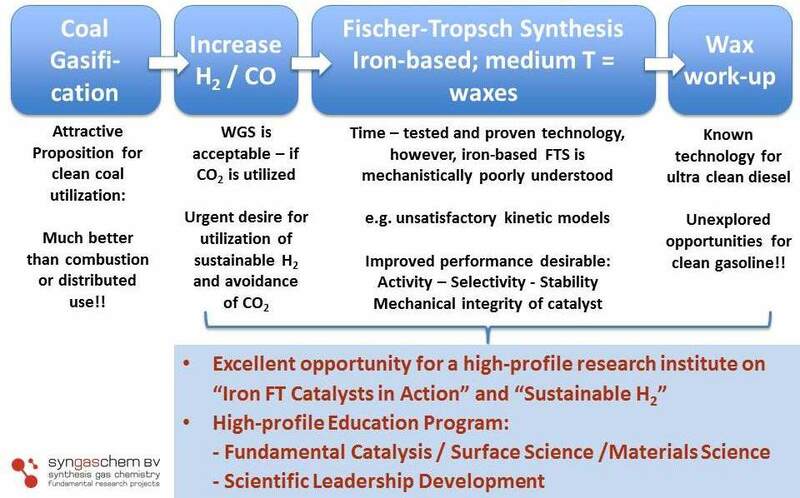 At the moment, our research focuses on understanding the iron-catalyzed FTS process. We believe, that such understanding will enable the improvement of the catalyst's activity, selectivity, and stability. Investigating new routes in wax refining could play its part to make clean CTL even more profitable in the future. Reducing the carbon footprint of coal-to-liquid technology as a whole receives our full attention by actively supporting research on sustainable hydrogen. All this cannot be done alone and on short notice. Many highly educated and fully developed scientists coming from different disciplines are required to work together for many years in order to enforce significant breakthroughs. We feel privileged that our partner, Synfuels China, enables us to jointly constitute a new laboratory for fundamental catalysis in Beijing, where - in close collaboration with an international network of universities and research institutes - we can put the research philosophy outlined above into practice. At the moment, our research focuses on understanding the iron-catalyzed FTS process. We believe, that such understanding will enable the improvement of the catalyst's activity, selectivity, and stability. improving the carbon footprint of coal-to-liquid technology as a whole receives our full attention by actively supporting research on sustainable hydrogen. At the moment, our research focuses on understanding the iron-catalyzed FTS process. We believe, that such understanding will enable the improvement of the catalyst's activity, selectivity, and stability. In addition, research on hydrocracking will play its part in the improvement of wax refining. Finally, improving the carbon footprint of coal-to-liquid technology as a whole receives our full attention by actively supporting research on sustainable hydrogen. We feel privileged that our partner, Synfuels China, enables us to jointly constitute a new laboratory for fundamental catalysis in Beijing Ã¢Â€Â“ Link SynCat@Beijng Ã¢Â€Â“ where, in close collaboration with an international network of universities and research institutes we can put the research philosophy outlined above into practice. At the moment, our research focuses on understanding the iron-catalyzed FTS process. We believe, that such understanding will enable the improvement of the catalystÃƒÂ¢Ã‚Â€Ã‚Â™s activity, selectivity, and stability. In addition, research on hydrocracking will play its part in the improvement of wax refining. Finally, improving the carbon footprint of coal-to-liquid technology as a whole receives our full attention by actively supporting research on sustainable hydrogen. We feel privileged that our partner, Synfuels China, enables us to jointly constitute a new laboratory for fundamental catalysis in Beijing ÃƒÂ¢Ã‚Â€Ã‚Â“ Link SynCat@Beijng ÃƒÂ¢Ã‚Â€Ã‚Â“ where, in close collaboration with an international network of universities and research institutes we can put the research philosophy outlined above into practice. Green electricity supply notoriously fluctuates by nature and not by demand. Therefore, permanent storage of electrical energy is a key issue in today’s science and technology. Our current approach is to convert water and CO2 into syngas as an intermediate for synthetic fuel production. 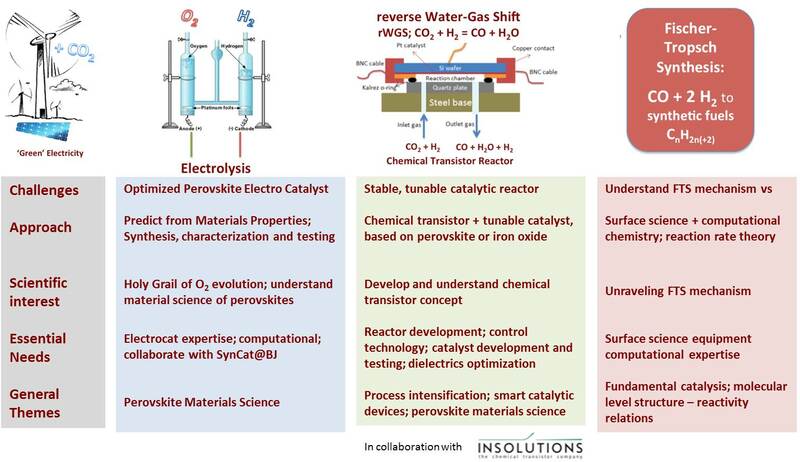 H2 production by water electrolysis and CO production by reverse water gas shift reaction are both processes, that can be propelled by new insights into the fundamentals of electrocatalysis, material science and reactor engineering, while insights into Fischer-Tropsch catalysis can generically benefit Clean CTL and Green Electricity Storage alike. We feel privileged that our partner, Synfuels China, enables us to pursue these activities with our collaboration partners in Europe. Plans are currently under development.